If it was not for the Santa Cruz & Monterey Bay Railway, a division of Ed Ellis's Iowa Pacific Railway conglomerate (which operates several short lines across the country), the former Southern Pacific's Santa Cruz Branch may have been abandoned. The history of this very scenic route, skirting the Pacific Coast northward from Watsonville, California along the Monterey Bay dates back to the late 19th century. Today, the SC&MB provides both freight and passenger service on the route with hopes that once the property receives significant infrastructure improvements more freight customers and additional ridership can be secured. 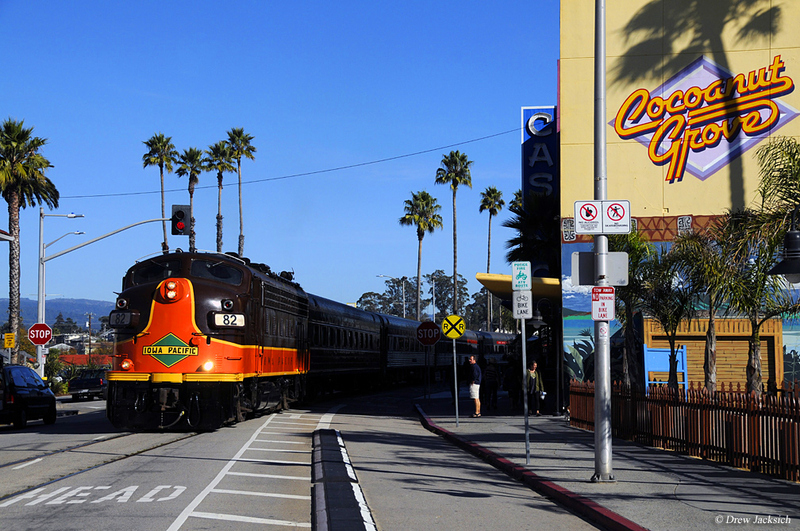 The route now operated by the Santa Cruz & Monterey Bay Railway has a history tracing to the 1880s. With the completion of the Transcontinental Railroad in the spring of 1869 and the growth of the Southern Pacific, California's railroad network expanded rapidly during the last three decades of the 19th century. Systems both large and small sprung up to serve growing cities, the state's rich agricultural regions, and abundant natural resources. 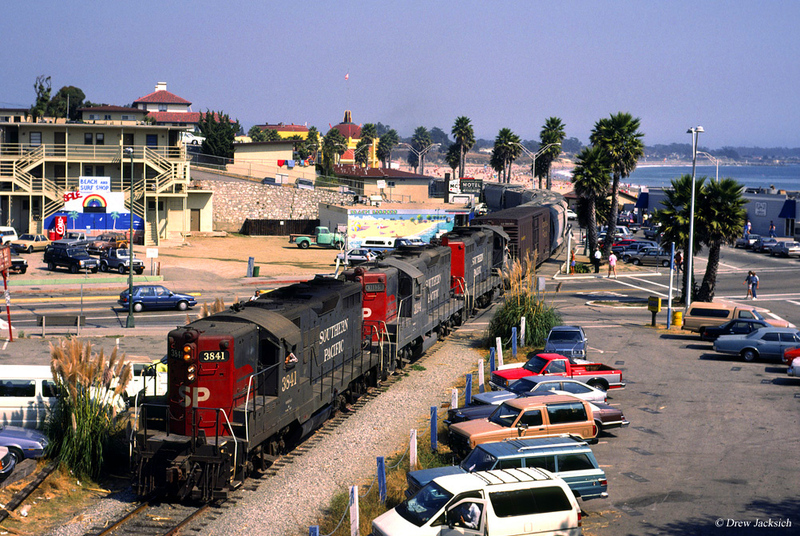 There were two railroads primarily comprising what is now operated by the Santa Cruz & Monterey Bay; the northern segment from Santa Cruz to Davenport is the remnants of the old Ocean Shore Railroad while the southern segment from Santa Cruz to Watonsville was originally the Santa Cruz Railroad. The first built was the Santa Cruz Railroad (SCRR), originally organized in June of 1873 by a group of businessmen from Santa Cruz, led by Claus Spreckels and FA Hihn, with hopes of extending a line southward to a connection with the Southern Pacific near Watsonville. The town of Santa Cruz and local county had initially attempted to lure Southern Pacific into building its main line connecting San Francisco with Los Angeles through their community but unfortunately the growing railroad elected to move its route further east. Undeterred by this setback community leaders set about building their own railroad. To fund the project county monies were used along the private investment and to keep costs down the SCRR was built to a three-foot, "narrow-gauge" right-of-way. Construction began during December of 1873 and used predominantly Chinese immigrants for manual labor. The route largely stayed near the northern coast of Monterey Bay passing through small towns such as Capitola, Aptos, and La Selva Beach. It took a year to open the first 5 miles east of Santa Cruz during December of 1874. After another year and legal wrangling the SCRR was finally completed to Watsonville where a connection was made at location known as Pajaro (slightly south of Watsonville). The railroad largely relied on agricultural products and was fairly successful. However, severe flooding in early 1881 severely damaged the trestle over the San Lorenzo River and forced the SCRR into bankruptcy after which time it was acquired by Southern Pacific that October. A few years later in 1887 the SP acquired an inside gateway to the Bay Area by purchasing he South Pacific Coast Railroad, another three-foot, narrow-gauge line that reached Oakland via San Jose. Under SP both lines were converted to standard-gauge (4 feet, 8 1/2 inches) for more efficient operation within the rest of its network. Alas, the original South Pacific Coast, which became profitable as a competitor against SP handling agriculture, timber-based products, other freight, and passengers survived as a through route until only 1940 when strong winter storms in the Santa Cruz Mountains damaged the property beyond repair and it was abandoned between Felton and Los Gatos (the segment from Los Gratos to San Jose survived until 1955 when it, too, was abandoned). Finally, the line north of Santa Cruz to Davenport was built in the early 20th century by a system originally known as the Ocean Shore Electric Railway. Initially, this project had strong financial backing by San Francisco businessmen who envisioned a coastal electrified line (utilizing 1500 Volts A.C.), double-tracked, running between San Francisco and the port of Santa Cruz. Construction began in 1905 on the northern and southern ends at Santa Cruz and the Bay Area with a projected completion date by February 1, 1907. Unfortunately, the Great San Francisco Earthquake of April 18, 1906 damaged the railroad and financially ruined its backers. The route was never finished running between only San Francisco and Tunitas Creek in the north and Santa Cruz to Swanton (just north of Davenport) in the south. Despite this setback the system managed to survive for a few years and subsisted on moving agriculture in the north and lumber products in the south. Unfortunately, lack of traffic, competition, and disagreements with the Southern Pacific forced the little road into bankruptcy in 1910. It was reorganized as the Ocean Shore Railroad but operated for only another decade before the new owners gave up entirely in 1921. The Southern Pacific acquired the southern segment, while a section of the northern end was purchased by the large Western Pacific. The line to Davenport/Swanton saw service throughout the years under SP, as did the old Santa Cruz Railroad, and the former South Coast Pacific as far north as Felton. In 1996 Southern Pacific was swallowed up by Union Pacific, which later attempted to shed the Santa Cruz Branch from its system. 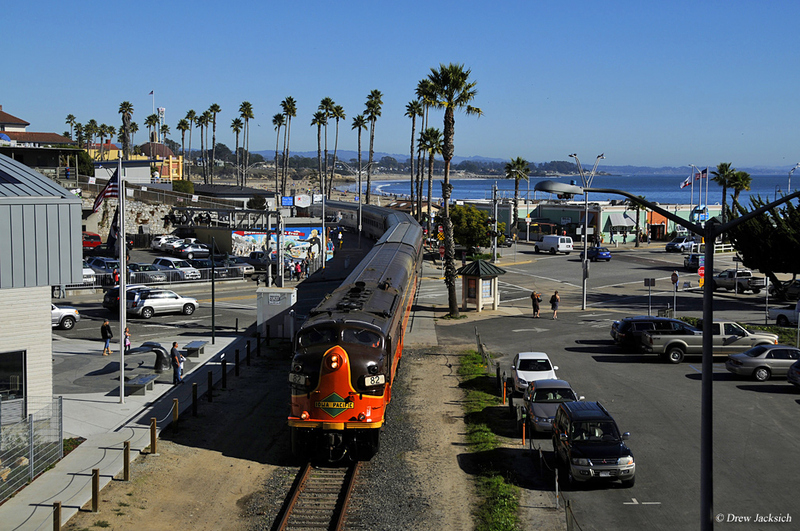 In 2011 the California Transportation Commission approved purchase of the line and on October 12, 2012 was acquired by Santa Cruz County via the Regional Transportation Commission. 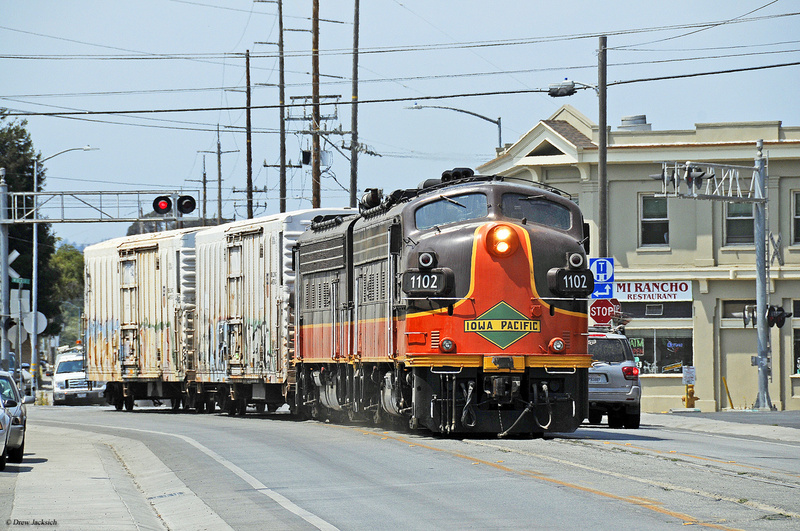 Soon afterwards Iowa Pacific was named operator and launched the all new Santa Cruz & Monterey Bay Railway to provide regular freight service, with current customers ranging from lumber products to frozen food manufacturers. In addition, SC&MB has launched public excursions, such as the "Train To Christmas Town" during the holidays. To learn more about available trips on the railroad please visit their website.